Photo obtained via the National Weather Service. Following Gov. Brian Kemp’s decision to close state offices on Jan. 29, and the city of Atlanta’s decision to do the same, local school systems are also cancelling classes on Jan. 29. 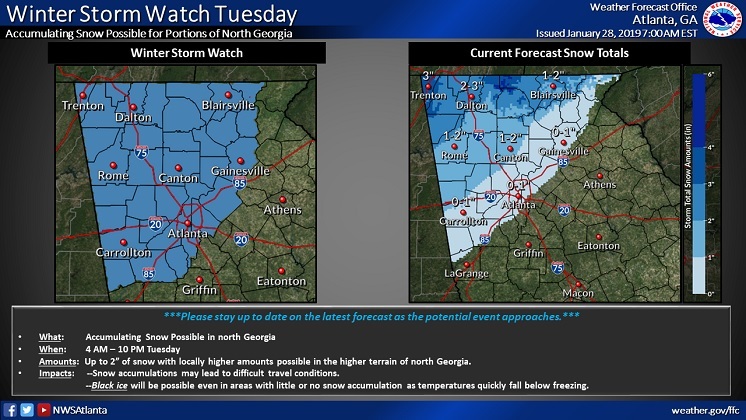 The Atlanta area could see snow on Tuesday and there are fears that the roads will become icy and dangerous. The Winter Weather Advisory is in effect on Jan. 29 from 3 a.m. to 7 p.m.
People are encouraged to avoid driving if at all possible. “We are working with emergency management officials to whether it’s appropriate to close offices on Wednesday, Jan. 30,” Kemp said in a press conference. Crews with the Georgia Department of Transportation have begun salting roads ahead of the storm, with a focus on downtown Atlanta. 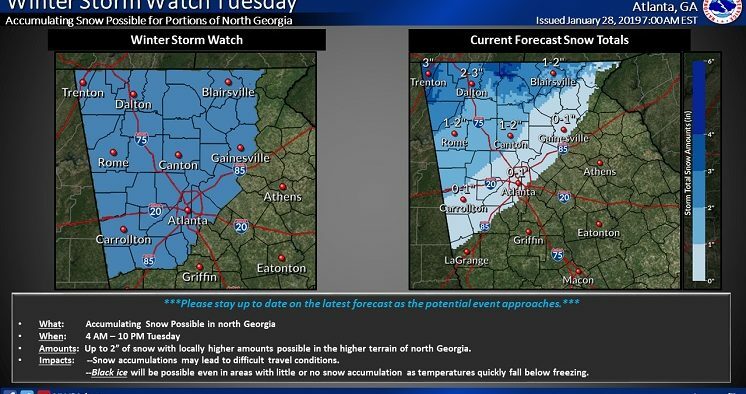 Atlanta Public Schools will be closed tomorrow as will DeKalb County Schools and City Schools of Decatur. Emory University and Agnes Scott College will be closed. DeKalb County offices will be closed on Tuesday, including DeKalb’s courts. Garbage collection will be delayed. The county will open three warming centers starting at 7 a.m. on Tuesday, Jan. 29 through noon on Friday, Feb. 1. Tucker city government offices will be closed. Employees of the city of Tucker will be able to work from home, the city says. 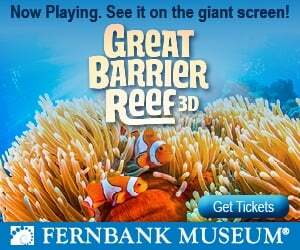 For more information about Tucker’s plans, click here. Avondale Estates and the city of Decatur both plan to be open on Tuesday. Decatur Mayor Patti Garrett’s state of the city address was scheduled for Jan. 29, but has been postponed to Feb. 5. A few inches of snow or ice can shut down a city and leave you trapped at home for days. Driving on ice and snow-covered roads can lead to car wrecks, injuries and death. Snow, ice and wind associated with winter storms can have a huge impact on travel, infrastructure, schools and businesses. Some winter storms can cover nearly half the nation, affecting tens of millions of people. Annually, damages from winter storms add up to over $1 billion. Frostbite may develop on exposed skin when temperatures are below freezing. Add wind to below freezing temperatures and frostbite can set in even quicker. Other winter dangers include hypothermia and avalanches. Flooding is also possible due to snowmelt, ice jams and coastal storms such as Nor’easters. At home: have an Emergency Preparedness Kit with three days of food, water, prescription medications and other supplies. Also consider obtaining a NOAA Weather Radio. Make sure your cell phone is fully charged when a storm is approaching and also anytime you’re planning to leave the house. It could become your life-line should disaster strike. In your car: make sure you have food, water and blankets in your trunk. Stay off the road when advised to do so by local authorities. Dress for the season: wear loose, warm clothing in layers. Don’t forget your pets! Keep them inside during cold weather. During and after the storm: never use a generator or kerosene heater indoors – carbon monoxide poisoning is a silent killer. After the storm: take breaks when shoveling snow and stay clear of downed power lines. Create a Family Communication Plan so that your loved ones know how to get in touch during an emergency. Help your neighbors before and after winter storms – especially the elderly, who are particularly vulnerable. Look for opportunities to help your town prepare, such as volunteering with the American Red Cross. The city will concentrate on providing a usable travel lane in each direction on major streets and clearing sidewalks near MARTA stations. The city will work with City Schools of Decatur to make sure entrances, exits, and driveways at the schools are clear. Residents should expect to clear their driveways and sidewalks. It is unlikely that the city will be able to clear interior neighborhood residential streets. If you, or a neighbor, are a senior, someone with a medical need or someone with special needs, consider creating a safety profile at smart911.com. Stay tuned to thedecaturminute.com blog, City of Decatur GA-Government on Facebook, @downtowndecatur or Twitter, and the city’s website for information about facilities closures. These simple steps will help keep you safe from blizzards, ice storms and other winter hazards. A little bit of preparation can make a big difference. And many of these steps – such as preparing an Emergency Supplies Kit – will also come in handy for other hazards, such as hurricanes or power outages. Stay tuned to www.decaturga.com, social media and thedecaturminute.com for up-to-date information. This story will be updated with news about additional closures as that information becomes available. Don’t miss the latest news from Decaturish. Join our mailing list!